Size: width: 18cm/7“, length: 127cm/50“. This scarf can be easily made longer or wider. Skill Level: Easy, mindless knitting. Suitable for beginners. You need to knit, slip, cast on and bind off. Yardage: 2 balls in Main Colour (grey no.13), 2 balls in Contrast Colour (plum no.58). Needles: 4mm (US size 6) straight or circular needles. Notions: Tapestry needle to weave in ends. 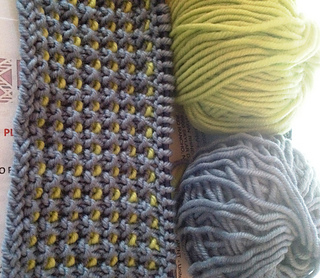 The Slip-Stitch-Scarf is an easy beginner’s pattern that produces a stunning scarf. The pattern immitates classic woven/checkered structures with its two colours. 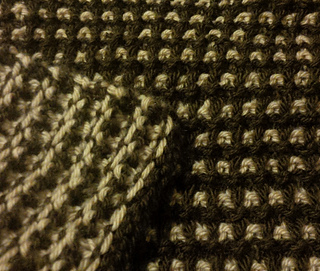 But don’t be intimidated: you only knit one colour per row. The slip-stitch-pattern is based on garter stitch so the resulting scarf is really soft, warm and squishy (and you don’t even need to know how to purl!). It’s easy to incorporate a very strong second colour without getting too bold. On this example it’s purple framed by grey. Ready for the next level? The Slip Stitch Flip Tops feature the same stitch pattern worked in the round!